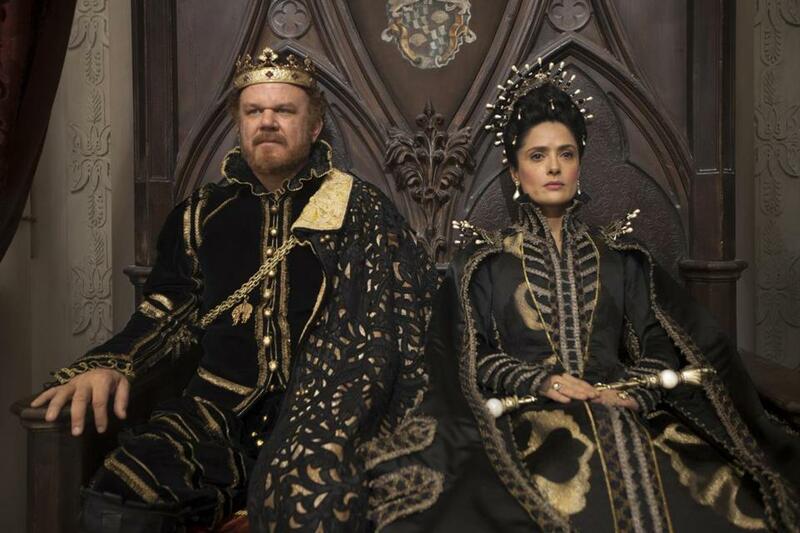 “Tale of Tales,” a luminous, loose adaptation of Giambattista Basile’s 17th-century fairy tale compilation by Matteo Garrone, evokes many tales, such as Mark Twain’s “The Prince and the Pauper,” Franz Kafka’s “The Metamorphosis,” and “Cinderella” by Basile himself. Like those stories, it balances otherworldliness and banality, sublimity and grotesquery, wonder and horror. As in “Game of Thrones,” it is about several kingdoms and the schemes and folly of their leaders. The Queen of Longtrellis (Salma Hayek) yearns for a child and is willing to sacrifice the life of her husband (John C. Reilly) to get one. The King of Highhills (Toby Jones) has a daughter, but neglects her for his odd hobbies until he entangles her in a hideous marriage. And the King of Strongcliff (Vincent Cassel), a Felliniesque libertine, has neither a wife nor a child nor any wish for them until he hears the angelic voice of a mystery singer. Familiar scenarios, but with unexpected developments and details. Like a pet flea the size of a small car, two bonded albino twins, and an androgynous woodsman who suckles a crone and turns her into a pre-Raphaelite beauty. These surreal images are heightened by the sublime special effects and set designs, not to mention the exquisite cinematography of Peter Suschitzky, with its tapestry-like colors and stark, monumental compositions. As for Garrone, his influences are not just literary but eclectically cinematic, as in one scene that combines Fritz Lang’s “Siegfried” (1924) with Richard Fleischer’s “20,000 Leagues Under the Sea” (1954). He seems to have evolved from the journalistic realism of “Gomorrah” (2004) to the meta-realism of “Reality” (2012) to what in his film might be described as realistic magic — making the ordinary extraordinary and vice versa. Despite the fabulism of “Tale of Tales,” it remains rooted in contemporary issues. Prince Charming does not figure much in this film, but women do. They are overwhelmed by motherhood, or obsessed with youth and beauty, or determined to attain independence and explore the world. These tales are retold from a perspective that makes them new again. Directed by Matteo Garrone. Written by Garrone, Edoardo Albinati, Ugo Chiti, and Massimo Gaudioso, based on stories by Giambattista Basile. Starring Selma Hayek, John C. Reilly, Toby Jones, Vincent Cassel. At the Brattle. 133 minutes. Unrated.